Gloucestershire County Council, NHS, Public Health England and the Local Pharmaceutical Committee have all teamed up to help raise awareness of antibiotic resistance. Over 40 local schools and colleges were approached and asked to submit entries to an awareness raising competition as sixteen – twenty four year olds are amongst the highest misusers of antibiotics. Antibiotic resistance doesn’t just affect us here in Gloucestershire - if nothing changes, by 2050, 90,000 people in the UK will have died from antibiotic resistance. People develop antibiotic resistance from taking too many antibiotics, often when they are not needed. For example did you know that the common cold and flu are viruses and cannot be treated with antibiotics? The winning entry from graphic design students at Gloucestershire College will now be transformed into a county wide awareness campaign supported by an animation, billboards, bus advertising, social media and interactive web pages. View the campaign and improve your own knowledge about antibiotic resistance by taking our online quiz at our new webpages. 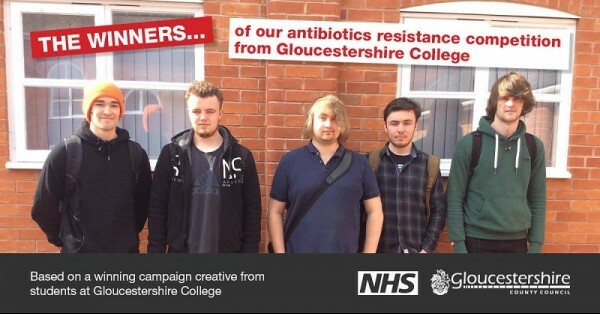 External Website: More details about Gloucestershire County Council and Gloucestershire College students – winning against antibiotic resistance!